Well, it would seem that it is that time again. The season has changed, and it is time to take another look at the state of the Pop! Blanket. We see that we have another sixteen squares in their unblocked, curling glory. I know you have been wondering, wishing, and hoping that I would show you how these look before blocking, so this must be your lucky day. Actually, there are more than sixteen in the pile, and I have knit even more since I took the photo. I have been knitting a bit here and there in spare moments, and while it feels like I have not been doing much, the little bits add up to real progress. Oh, how I forget to remember that! Anyway, I had left this project alone because I needed the break, but it has sat for long enough. Speaking of enough, I wonder how many squares I should make. I have been working on this for so long, it seems like I should have a huge blanket when I am done. Then again, how big of blanket do I really want? The other question I must ask myself is whether I am just trying to get out of working on this any longer and wanting to be done. Letting a project sit undone for too long is not my favorite, but this is the time of year when there are other things I could be making. On the other hand, it is also getting to be the time of year where having a new blanket will be wonderful. Sometimes when life stresses me, I knit many small things. This time, I had the idea of knitting large things. It was a thought of knitting several of the large things to help with something even bigger. Then it became clear that my involvement in the situation would not be helpful. Still, I had the pattern, I had the yarn, and I wanted to make it. Then another bit of difficult news arrived, and it took several attempts to get the tension on my stranded knitting under control, but focusing on that helped. Soon, I was planning making more for every gift-giving occasion through the rest of the year. Of course, I have thought better of that, seeing as how most of the birthdays in the family fall between now and Christmas. It's not like that will not keep me from making more as gifts, just not one for everyone. Besides, not everyone wants a big gnome. No, really, it's true; I just don't always figure it out in time. 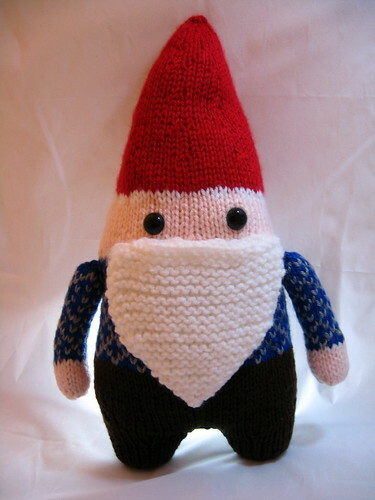 For now, I have one large gnome completed, and I love him. His future is still up in the air; he might be a birthday gift for someone, or he might live here forever. A couple of years ago I was at a local knittogether, and the topic of unexplored knitting techniques came up between some of us. Two of us discovered that we had never even attempted entrelac, and we decided that we should do something about our lack of entrelac. Well, the rest of 2011 was already claimed, and there was something about 2012 that wasn't going to work, so we decided on 2013. Add in this, that, and the other, and it was August, and we finally got down to it. 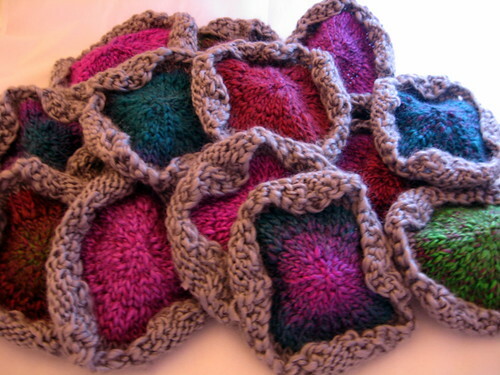 Helen chose the garterlac dishcloth pattern to help her with a blanket square project. Since I did not want to just knit a swatch, I decided to follow in the footsteps of many a beginner and knit a scarf. Well, at least that was the plan unless once I got past the learning I decided it wasn't something I wanted to do. 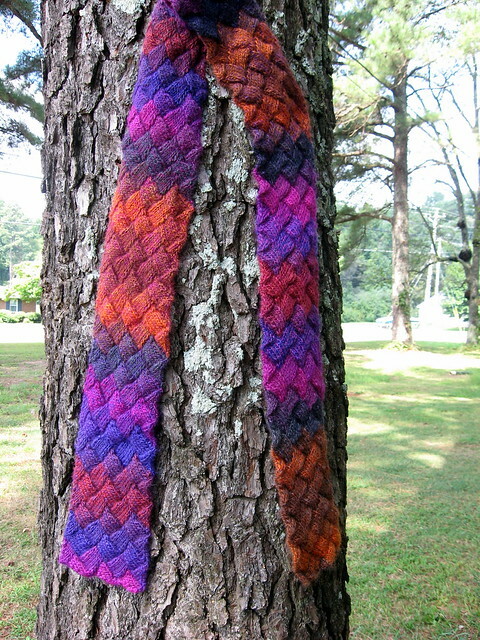 I chose KnittyOtter's Entrelac Scarf and Tutorial, and it worked wonderfully for me. I kept going long past the point of caring, and by the end, I was back to enjoying the process. I adore my scarf, and have learned something new, too! Yes, another month has come and gone, and once again, I find myself thinking it has been both very long and very short. The fact is, a lot has been happening, and I have even had an increase in my knitting. I do not know where "putting together a shed from a kit" falls on the major life stresses list, but it is probably pretty high up there. This adventure has been going on for far too long, but the construction has only been for the last week, and we are still not quite done. However, we are carrying on, following the directions, taking it step-by-step, and hardly throwing any temper tantrums. We have had some good help, and that has made all of the difference. I will say that the shed crew might have used their allotment of jokes about not being able to get it in the hole, the sack of nuts, and size/measurement, but as long as they are helping, I really do not mind. It seemed the babies had avoided the rounds of Hand, Foot, and Mouth Disease sweeping through daycare, but we were wrong. It has not been fun, but there are certainly worse things to endure. For example, putting together a shed. In the midst of shedding, plague babies, and various terrible things, I found another opportunity to make more tiny things. I heard from a dear friend from long ago from whom I had not heard in quite some time. I wanted to make something for him and could not decide what it should be. After spending too much time looking at patterns for hats and thinking about scarves, I switched gears and decided to make small things. I knew I could make them quickly and could leave the other things for another time. Besides, these are fun and maybe a bit silly, and life should have more of that.